Come stay in this clasic Cayucos family beach house and enjoy the beautiful ocean front views! 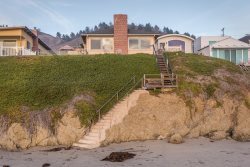 This is a perfect place to soak into the Cayucos laid back vibe and stay in a comfortable and charming family home with private stairs to the beach! The prime location on Pacific Avenue makes this home walking distance to town, steps to the beach and a short drive up the coast for fun attractions. 3 bedroom, two bath, single level home. 1st bedroom has king bed, 2nd room has queen size bed, and the 3rd bedroom has 1 bunk bed with 2 twins and a 3rd twin bed. Warm and friendly family home, with wonderful ocean views from living room and kitchen. Street side gated patio area, great for barbecuing, and beachside patio with picnic tables and lots of beach chairs. PRIVATE STAIRWAY TO BEACH. VACATION READY. Amenities: BBQ, W/D, dishwasher. Plus- wireless internet.